What do you think about a seller in HongKong (China in general) shipping a 1 pound package to New York City for $3.66 while a seller in New York City pays slightly under $6.00 to ship the same weight package? 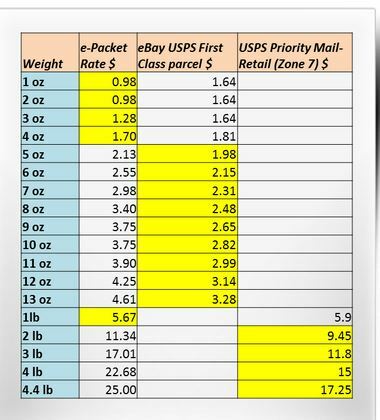 Last year the USPS lost $75 Million dollars on this level service along (who knows how much on smaller weight packages). Anyone who thinks they can make this up by shipping this lost leader in larger volume missed math classes and economics 101. The deficit has to be made up by someone, and guess who that is? 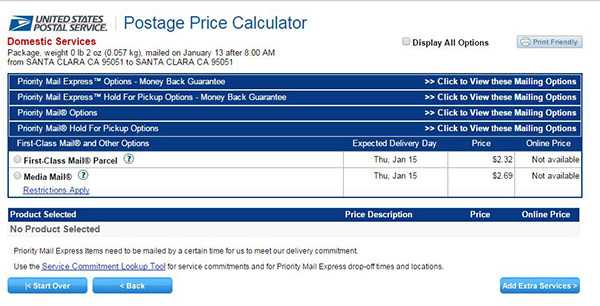 It is either higher USPS rates for everyone in the US or it is the US taxpayer! I have spoken to the UPU who is collecting the protest and they are anxious to hear from the US citizens. These negotiations I believe were held in secret and partly supported by companies like eBay. Amazon has gone on record as opposing the rates. Below is my letter to the UPU (and while I serious doubt it will be taken into consideration, I believe I speak for most US citizens that think this is patently unfair competition. Statement from a Small Business AGAINST further sponsoring low cost shipping from China. As Amazon told Congress last year, Chinese sellers can ship to the US. The IG Office said: The terminal dues provided through the UPU framework are a money-losing proposition for the U.S. Postal Service and many other national posts, according to USPS Inspector General David Williams. The IG’s office has reported that the Postal Service lost $75 million last year delivering inbound mail from foreign senders, and the rise of the online channel for cross-border commerce is only adding to the challenge. This presents an unfair competition to the very heart of American businesses. The presumed assumption that this low cost shipping goods to Americans at a lower cost somehow benefits America is not valid. It is hurting Small Businesses and by penalizing these small businesses, you are thwarting growth and employment. Surely you realize that those low cost goods do NOT represent any employment in the US, just a burden on the Post Office to deliver the packages –without the same compensation as delivering packages shipped in the US. Rising Postal Rates, compound the injury to American Businesses. Any supposed benefit to Americans purchasing goods from China under this unfair agreement are more than offset by the number of small businesses just throwing up their hands and laying off employees. I may be a small voice of one, and doubt seriously any affect or that my submittal will be read, but I feel it my duty to go on record opposing this continued penalty to Small Businesses. Ellen, You can certainly voice your opinion with the US Government. That’s what we are all about. Freedom of speech! Our blog is NOT a political platform, we are just concerned that Chinese sellers do not have an advantage in shipping over US sellers. We do NOT import from China, our goods are all Italian! And the Italians certainly do not get an advantage in shipping? But we would never ship our goods to the US through USPS, we use DHL or FedEx! Brenda thank you for your efforts to educate the public about this and submitting your own comment to PRC IM2016-1 Section 407, regarding reform for an outdated terminal dues system! I have been your customer for years and was happy to see you are my ally in this. Please be aware that this docket is heating up right now. I don’t know if you sell on Amazon or not. If you do, there is a seller’s thread I have created on the general forums with the title: “Postal Reg Commission is reviewing Docket to change low China terminal dues” . If anyone interested goes to the Amazon seller’s forums and does a search for this title, my thread will come up. I am posting all information I can find on this issue. It was rumored in one blog source that the docket went up for decision to the PRC on August 31st but that appears to be untrue (I called PRC and spoke to their secretary). Rather, on that date four congress people submitted a compelling letter to the PRC imploring them to strongly raise this issue at the upcoming UPU Congress in Turkey. I have yet to be given the exact date of the UPU Congress but it is coming up quickly and it seems that is the time this docket will be reviewed and changes discussed, possibly even decided upon and implemented! It may be relevant to have ecommerce sellers call and email congresspeople right before the Congress meets. Or those closer to this may have other suggestions of what we can do. I have phone calls in to three key people, including Attorney Kenneth Richardson who is the attorney for the people’s interest on this docket. I called and left voice mails right before the labor day weekend started, so I suspect they will begin returning my calls on Tuesday. I plan to find out the best way for those of us concerned to have impact by speaking to the attorney and share that information on the Amazon sellers’ forum, the ebay sellers forums, my twitter and anywhere else I can think of. Please find the Amazon thread and follow it if you wish to stay informed. People interested can also set up google alerts for the phrases “UPU Terminal Dues” “terminal dues reform” “China Terminal Dues” “IM2016-1” “Section 407” and even “UPU Congress”. They are being very hidden about this unfortunately and those of us who feel strongly are working hard to shine a light on things and get people involved! Thanks, When you have new information, I will be happy to post and to send out in our newsletters. The US Post looses money on each and every e-packet. It is ridiculous to think it can be made up in a higher volume. At the same time, increases for shipping within the US are expected to go up – to cover chinese shipments? I believe in competition. This is NOT. This is special interest. Unfortunately, when we had the opportunity to speak out via the PRC comments, few people responded. The people in charge of gathering comments are very accessible to everyone and helpful navigating their web comment system. Personalize the below letter and snail mail it to the address on the heading or email it to a State Dept assistant who has kindly offered to take emails on this matter and forward them to the appropriate Delegation…email address is martenr@statedotgov (spelled out as I’m not sure if the system will allow me to post emails). I am one of millions of small American businesses that suffer economic damage from the unfairly low terminal dues charged for Chinese packages being shipped into the US. To ship a two ounce package costs me over 250% of what a Chinese shipper pays to deliver the same package to a US customer. (Marjorie’s note-not part of letter: feel free to google for exact rates of type of package you ship and personalize this statement if you prefer- I chose the most common small sized first class ecommerce package and compared it to the e-packet). This creates an unfair imbalance, giving Chinese ecommerce merchants a powerful and unjust advantage over domestic sellers who benefit our own country’s economy by creating employment. The expense of the ever growing burden of Chinese packages in the USPS system also drives up the future fees I must pay for shipping. The inequity of the current terminal dues system is one large factor in constantly rising postal rates. China is not a developing country in the arena of ecommerce. Rather, it is currently dominating much of ecommerce in our country. It should not be given the same economic advantages the UPU extends to developing nations. Charging Chinese shippers terminal dues fees substantial enough to cover the expense USPS bears to deliver the package will have strong positive effects on the American economy, especially for small businesses engaging in ecommerce. It will also ease one significant and growing financial burden upon our USPS system, which is necessary for the infrastructure of our country and is already struggling on many fronts. I ask that you represent the interests of the American economy and the concerns of the American people when participating in the upcoming UPU Congress. We need your help, your strongest representation of our concerns. I ask that you make every effort within your means to change the current terminal dues system in place, so that Chinese package terminal dues actually cover the cost of their delivery. After speaking to Public Representative Attorney Kenneth Richardson and researching many avenues, I have uncovered two ways that citizens can still voice their concerns (to the PRC Chairman Taub and to the State Department). The UPU Congress begins on September 20th, so I recommend submitting letters as soon as possible- I submitted mine today. I posted following instructions in the Amazon’s seller forums as of this morning. I am copy and pasting it here- use however you see fit weather you publish my comment or instead use it in your own blog post. Fellow sellers, below you will find sample letters and instruction for how to submit your concerns about low Chinese terminal dues to the Postal Regulatory Commission and the State Department. I will be making two separate posts here, one for each office due to the length of the post and need for differing letters for each office. Please personalize the template letters I provide. They will have much stronger impact if you make them your own. If you have any questions about the facts provided in the template letter or how to fact check your own comments, you can direct message me and I will do my best to help. I will check messages frequently during the day. I strongly recommend doing this today as the 26th UPU Congress begins in just over a week! I ask that you represent the interests of the American economy and the concerns of the American people when making your statement to the State Department on this matter. We need your help, your strongest representation of our concerns. I ask that you make every effort within your means to change the current terminal dues system in place, so that Chinese package terminal dues actually cover the cost of their delivery. Once you have personalized the letter, to submit it you can snail mail it to the address on the letter heading or submit it on the PRC website (more effective and faster), which requires creating a temporary account (step by step instructions provided below). 2.) Create a temporary account by filling out your information with real name, address, phone number, choose username with only letters, password and click “submit” at the bottom. You will need to remember your username and password to log in on the next screen you see. Click the blue bar that says “create filing record” on next screen that comes up after log in. 3.) Now you have an online form to fill out. -First field is the docket number, for which you must choose IM2016-1 from the drop down menu . -Click “upload files from computer”. It takes you to a screen where you click the choose file button (any file ending in .DOC, .WPD, .RTF, .XLS, .DOCX or .XLSX). After you have chosen the file for upload, there is a button that says “upload file and return” that you must click. Then you are taken back to the original filing template screen with your document showing as attached. There will be a button underneath the “upload file” section that says “convert to PDF”. I recommend clicking that button. Then the system automatically generates a PDF from the original file you uploaded and attaches that to what you are submitting. -Then a detail review page comes up where you must once again click “submit” or the submission does not go through. So you will have clicked a box that says “submit” twice or the system will not get your letter. 4.) At the end you will see screen that says “filing receipt” confirming that your submission went through. It will take a processing day or two, but you should see your letter show up on the PRC website under the letters section for IM2016-1.